a) create a link that becomes an email link, ie. opens up the viewers email program with the given address? b) link a picture directly to its larger view? The first problem being that one can no longer write html code directly into the text window. One can write html code but one must start by opening the html window, before writing in the regular text window, or one will get mightily confused by what one sees in the open html window. (Html window is reached by clicking html button.) If one has already written in the opening window, (which is the Rich Text editor), this will all be viewed as html code in the html window. That means all punctuation symbols will be all translated to their counterpart html symbols - very hard to read around unless you're really good at this stuff. So if you go the route of using the html window you probably need to do it all there. The other problems are that a) every 'update' scrunches the code together. All the line spaces between tags that one generally uses for ease of proofing/editing will be gone. b) every 'update' rewrites the code to the format tinymce uses. A url to a location in your blog directory gets translated to a <BLOG_URL> tag for instance. So I tested to see if one could perform these two actions using the rich text editor. Yes one can. email link: to enable the link feature, something needs to be highlighted first. That something is whatever you want to act as a link. Text or picture is highligted/selected, the link feature becomes an option. You may then click that button to insert your link. If an email link, just write mailto:someone@address.com in the url blank that opens with the 'insert link' window that opens. In the 'title' blank enter what you want the mouseover title to say. If a small picture to large picture link, first make sure you have uploaded a larger picture to your filemanager and you have the url to that file. (I'm assuming you know how to do this.) You have also already added your small picture to your blog post using the 'insert picture' button. To make this picture a link, highlight/select it and click the 'insert link' button. In the window that pops up, you enter the complete url of the big picture (which you already uploaded to your filemanager). Here is a recent painting that one of my students did in class. It is from a photo I took at McLoons in Spruce Head, Maine. 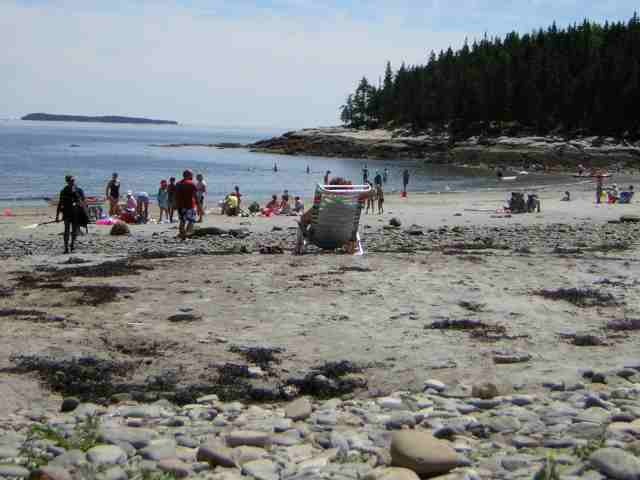 This is Birch Point Park beach (larger view). It used to be known as Lucia Beach. I went there the other day on a little picture taking trip in search of reference material for my watercolor classes, in particular I was looking for beach roses. They're gone for the season though. There may be another round at the end of the summer. I was so surprised at how many people come to this beach now. There were rows of school buses with their hoards of little day campers. Kids were having their arguments with each other over who would get to sit next to the window on the ride home as previously agreed. Agreements were being broken because one had called a young man's long shorts 'capris'. This did not sit well with the young man and therefore the young lady was not about to sit well in the window seat. There were some tears too in this little drama. But I was there for just a few moments and on to lunch elsewhere. My siblings and friends will remember when this was a sparsely populated beach. We used to marvel at the rusted metal sculpture of a drowned sailor that rose up out of a tidal pool on the rocks. Watercolor paintings of Owls Head Maine in cards and prints. Just a note to say - this Tripod webhost has been making software changes to the Tripod blogs that have yet to work properly. It is very difficult to leave comments, and with some glitch or supposed fix happening the past 24 hours, may not be possible at all. I've finally started a blog. It will surely contain a lot of nonsense. I often have to write a lot of that before anything of interest comes out. Perhaps I'll think of a way to separate the two. I know, its called editing. But I also like being able to see the thought process, so I may have a tendency to leave the nonsense. And, so now what do I write about? I just wanted to get this thing set up and on the road. I have to write something so I can actually see it. And who knows when I'll be ready to show it to anyone else. I realized, when I write in my (paper) journal I have no real consideration of whether or not my thoughts will be understood by anyone. I basically write for me to remember things that have happened or the thoughts I've had, and as a maybe trove for someone in the future to come across, maybe learn from, maybe see what another person's journey was. But to publish something for anyone to read one must have some awareness of whether it will be meaningful to the 'audience'. And it just hit me that writing a blog will be quite different than writing a journal in that way. Here I was thinking I'd finally be able to put out there some of the points of views I have on things and it would be as simple as one two three, but NO, one must still have a concern with how things are read, how things come across. Hmm. I'm not sure about this now.